The event started with a mass rally from Jawlakhel which rested on Patan Durbar Square where a condolence ceremony for the departed souls in 2015 Earthquake. was held. The programme was chaired by lalitpur CDO Mr. Dipak Kafle. Lalitpur LDO Mr. Hari Prasad Dahal, Member of Parliament (MoP) Mr. Chandar Maharjan, MoP Mr. Madan Amatya were some of the renowned dignities among many others who were present in the event. The main objective of the event was to sensitize the public for construction of safe and earthquake resilient buildings and community infrastructure for ensuring maximum safety and preparedness for possible major earthquakes in the future. 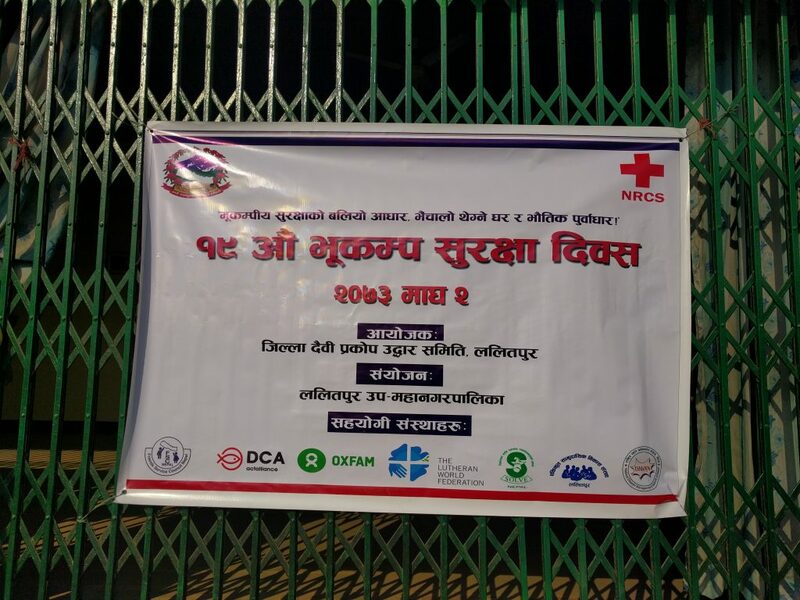 As an active supporting agency, FSCN also participated in the rally and in the Durbar Square event by involving its staffs, community volunteers and community people from its project locations. The key messages were spread by FSCN by displaying various posters, informative banners and distributing IEC materials along with pamphlets with earthquake safety messages. Lalitpur CDO Mr. Dipak Kafle along with LDO and other key speakers appreciated the effort of the supporting organizations for their participation and contribution for the success of the event. An estimation of over 2500 people participated in the event. Immediately after the completion of the event, FSCN staffs, volunteers and community members had a review meeting for the event to discuss about the way forward for conducting DRR activities in the communities in more effective and scientific manner.